Three Polish productions are among nominated animations. 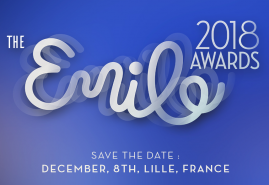 Emile Awards recognises the most interesting animated films made in Europe. The organizers value filmmakers' diversity and creativity, that is why they came up with 18 categories and one special award. This year the Lotte Reiniger Lifetime Achievement award will be given to Clare Kitson. The other winners will be announced during the official gala, which will take place on December 8th in Lille, France. Three Polish animations are among the lucky ones. Polish-Lithuanian coproduction "Last Stop Is the Moon" by Birute Sodeikaite was recognised for its background and character design just like "Another Day of Life" by Damian Nenow and Raul de la Fuente. The feature film about Ryszard Kapuściński's journey to war-torn, plunged into chaos Angola received a record-breaking number of nominations. The film was also nominated for best writing, direction, sound design and soundtrack. Another film nominated for European Animation Awards is "Bless You!" directed by Paulina Ziółkowska. It is the second time when this Polish animator is competing for the best achievement in a student film award. Last year her other film "Oh Mother!" was in the same category.